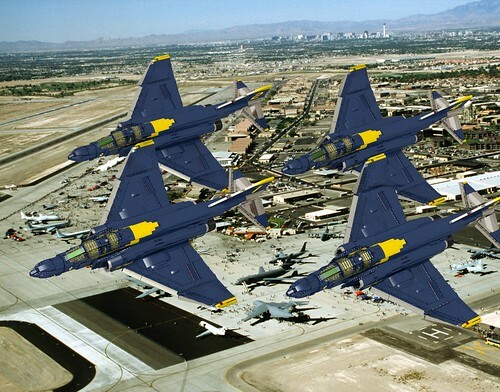 Blue Angels 4-ship diamond formation of McDonnell Douglas F-4J Phantom IIs. 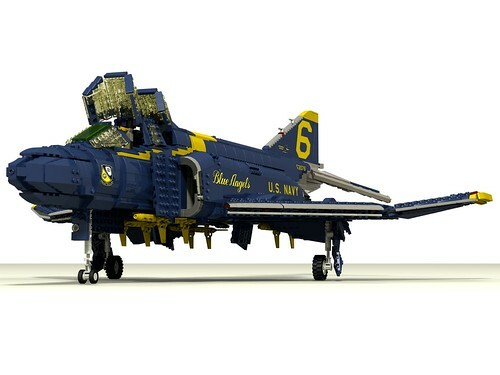 The US Navy's aerial display team the Blue Angels transitioned from the Grumman F-11F Tiger to the McDonnell Douglas F-4J Phantom II in 1969. In 1974, due to the fuel crisis, they switched to the more economical McDonnell Douglas A-4F Skyhawk II, continuing in that aircraft until 1986 and the switch to their current aircraft, the McDonnell Douglas/Boeing F/A-18C Hornet. The Phantom II notably was also flown by the US Air Force display team the Thunderbirds at the same time as the Blue Angels, the only time both teams have flown similar aircraft (although the Thunderbirds flew the F-4E variant). The models feature detailed pilot and WSO cockpits with opening canopies, opening radome with antenna, retractable landing gear, folding wings, deployable ram air turbine (RAT) and Naval style inflight refueling probe, and positionable flaps, flaperons, spoilerons, leading edge flaps, airbrakes, tailplanes, and tail hook. There is something just inherently awesome about a shot of the Blue Angels flying in formation. Great work! Very good MOC, you've captured the look and feel perfectly. Awesome job! I've actually sat in one, f/a 18, airshow in Halifax, Nova Scotia, the sheerwater international air show, we have are own team too, the snowbirds BACCA. I remember these from the Mythbusters. Magnificent machines!